UNless some USB device is involved the USB (upper and lower, and also middle) filters are totally irrelevant. As well there is no need to disable "many" services. Traditionally (but I cannot recall the details) I seem to remember that Firadisk gave better results with map --mem RAW images whilst Winvblock gave good results with both --mem and direct map of the RAW image (or fixed VHD). to directly install the XP to the image directly mapped through grub4dos and Winvblock. Anyone know how to surgically remove rdyboost (not disable, remooooove) ? And reports this to SystemLicenseClient & passes validity of component. I have not been able to repeat this anomally, but if one where to modify the dll to query [HKEY_LOCAL_MACHINE\FAKEHIVE\CurrentControlSet\ProductOptions], then any version of Win7 is then VHD bootable. Or if one where to modify this key from WIM & make it readonly, and stop SYSTEM from modifying. I leave this information to you! Edited by DoleBludger, 08 July 2015 - 12:40 AM. that could be very useful info! thanks for sharing it here. I was pointed to http://antiwpa.plane.../vista/oldstuff where there are files with slc already patched, albeit for vista, they work! Thankyou to the author of these files. Do you mean you had to patch some files in your vhd system in order to use the native vhd boot feature on a non enterprise windows version? Can you describe the approach? Did you try by just modifying the registry offline? The files you mentionned are called rather later in the booting process and I kind of remember the error message appears quite early when attempting to vhd boot a non enterprise windows. SLC.Dll is in anyone of the packages obtained from the link provided. You can replace in wim, during install or after the error. Anyone of the packages has a readme too. so you just replaced slc.dll? no other dll? no modification to the registry? a full description would be nice. also, you do mean native vhd boot right (i.e not using g4dos) ? using a windows version different than pro or enterprise? Edited by DoleBludger, 10 July 2015 - 08:57 AM. on x64 systems Wich one did you replace? Did you replace both? I know Win7x64 ultimate can natively boot from VHD, but other x64 versions as Pro or home can't. I typed.......then i erased, it took 5 minutes! About the SLC.DLL patch, it patches SLGetWindowsInformationDWORD so that it returns always 1 (true). This can have some impact on some calls which expect a value different than 1 so I would not do this on a production machine. 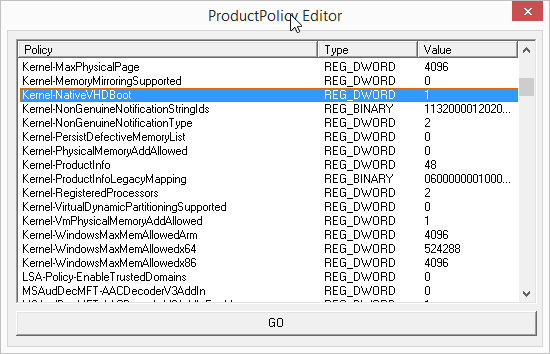 Note that SLGetWindowsInformationDWORD seems to call ntdll.NtQueryLicenseValue . 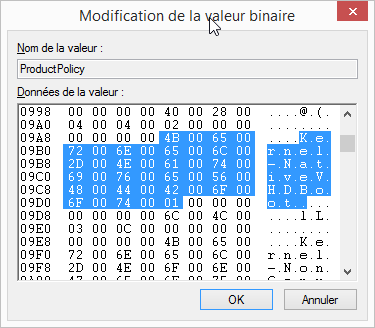 And ultimately the information is stored in the registry (HKLM\System\CurrentControlSet\Control\ProductOptions) so modifying the right bit (kernel-nativevhdboot policy) in the registry sounds to me a safer approach. In the screeshot below, my windows support native vhd boot (value=1). If somebody cares to try this theory, I could make such an editor (I would create a new thread on reboot.pro then...). Note that the above may apply to windows prior to Windows 8 only (as it seems to get more complex starting with win8). Cannot an off-line registry file be modified by using the offline-registry editor that someone already wrote? But I am stuck with windows 7 integral versions over here. But I cannot imagine that to be so easy since this vhd boot feature has been discussed on so many places on the internet (and reboot.pro) . Well, not really discussed that much. Discussions on VHD boot there are plenty, but this is specific about circumventing a license limitation in order to have VHD boot working in versions that are not licensed for it, it's dangerously near the border, actually at least a few inches beyond the border, as I see it. So all in all a series of off topic posts with also a direct link to an activation workaround that resulted being useful to workaround another license limitation. Indeed, the border between reverse engineering and hacking is very thin. The first is driven by knowledge, the second is driven by escaping license costs. Although the word hacking there may be incorrect/disputed and many could give another definition. Using useful informations found here, I did the below viewer. Note that I am only reading (not writing) the online registry and I am not using any windows API. A future version could write to the registry as well and/or perform read/write offline.